Review: 2014-05-09, Daniel Weichel vs Desmond Green gets three stars thanks to a good second part of the fight. Daniel Weichel entered this fight with a professional mma record of 33-8-0 (76% finishing rate) and he is ranked as the No.18 featherweight in the world, he won the M-1 Global lightweight title in 2011 against Jose Figueroa but he lost it at his first defense when he faced Musa Khamanaev (=Khamanaev vs Weichel), since then he has collected five consecutive wins. His opponent, Desmond Green, has an official record of 11-2-0 (27% finishing rate) and he entered as the No.30 in the same weight class, he suffered his second defeat in 2013 losing to Fabricio ‘Guerreiro’ de Assis Costa da Silva (=Guerreiro vs Green), after that bout he has fought and won twice. 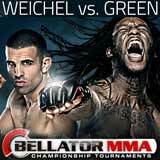 Weichel vs Green, main event of Bellator 119, is the final of the Bellator featherweight tournament. Watch the video and rate this fight!